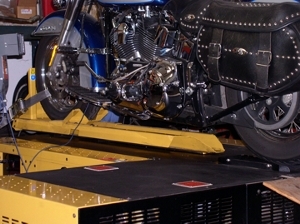 We offer professional dyno-tuning and diagnostics, as well as performance upgrades and factory recommended services on Harley-Davidson and American V-Twin Motorcycles. Does your Fuel Injected or Carbureted bike have any of these symptoms? We use a state of the art DynoJet 250i dyno and 30 years of Automotive and Motorcycle engine management systems experience to expertly diagnose and tune your motorcycle to make it run the best it can. We have years of experience with the TTS MasterTune, PowerCommander, Race Tuner and Super Tuner EFI tuning systems. We offer full service engine building and performance upgrades using only tested parts and components from reputable manufactures. We have tried and true combinations, but everybody's budget is different so we custom tailor every package to your personal budget and needs. No matter the level of modification, engines components MUST be matched in order to provide a fast reliable motor. Few shops do this and we are one of the best at it. We will be happy to offer advice even if you're doing the work yourself. Got an extended warranty on your bike? You are not obligated (by law) to have the dealer perform the repairs. We deal with the factory's warranty insurance company as well as many others to get your bike repaired and back on the road as soon as possible. If your bike is broken you want it back as quickly as possible. We offer a quick turnaround time so you miss as little of your riding time as possible. In the unfortunate event that you are in an accident, we will make sure that your bike's recovery is as painless as possible.